UPDATE January 17, 2019: Upon reflection over the past several days, I have been thinking deeply about this video. I've connected with many people about it and reflected on the comments below. I now believe this is a very important video that has sparked much needed conversation about men and women and the nature of our relationships. I still think there are flaws, but I applaud Gillette for putting out the video. It takes guts to do this and I jumped the gun with my criticism. Below is my original, unaltered post. 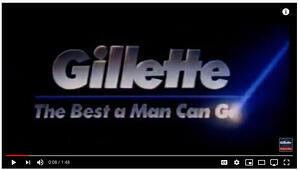 The first flaw came at just seven seconds when Gillette popped in an ad for the company into the film with the voice-over saying: “Is this the best a man can get?” (playing off the Gillette tagline). Secondly, and perhaps worse, the description of the video on YouTube says: “The Bullying. Harassment. Is this the best a man can get? It's only by challenging ourselves to do more, that we can get closer to our best. To say the right thing, to act the right way. We are taking action at thebestmencanbe.org. Join us.” I was expecting additional interesting content here at the dot org site, but sadly the dot org URL redirects to the Gillette dot com website where they market and sell their products. This is a bait and switch tactic used by the unscrupulous. When a company offers content for free, the mere act of giving the gift is enough. There’s no need to trade the gift for something else like your attention to an ad. This video is generating quite a backlash on social media and I think for the simple reason that they are trying to sell product. Unfortunately, this is not #TheBestMenCanBe.